I just spent two days with my best friend Deena at the St. Regis Hotel in Monarch Beach. We went there yesterday and had a massage, a manicure/pedicure, and an amazing meal. We stayed over-night, got up this morning and drove home, stopping at IHOP on the way. It was pretty amazing and very relaxing. The room was gorgeous and the view was unparalleled. From our balcony we could see the magnificent grounds of the hotel, the pool, the golf course and the beach. And we didn't have to pay for any of it!! It was taken care of by Deena's ex-boss. Massages are even sweeter when they're paid for by someone else. After 19 years of friendship, my best friend and I haven't run out of things to talk about. As a matter of fact, we can't seem to shut up! It was a really good couple of days. 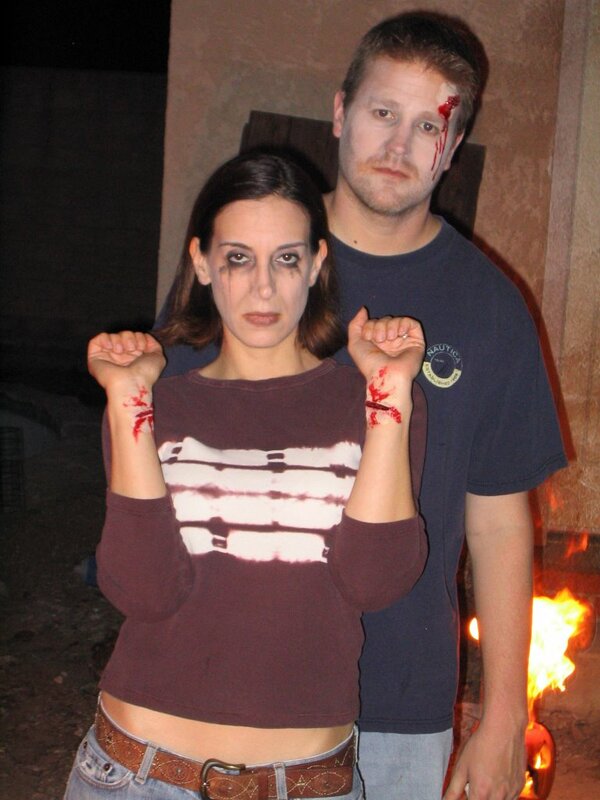 The night before, Deena and her boyfriend had us over for a Halloween party. I hate dressing up and so does Russ, so we went as a couple that committed double suicide. The party was pretty great. Everyone brought gross, Halloween-themed food such as beef ribs on a plate with a skull, pigs-in-blankets that looked like fingers, and my asparagus soup, which became Monster Snot Soup. There were also bat wings, instead of buffalo wings, and eyeballs made out of donut holes for dessert. Our hosts had built a phenomenal graveyard in their backyard graced by all of their guests' tombstones. As much as I don't like Halloween, this actually really got me into the spirit of things. Anyway, just thought I'd share the weekend's highlights with you. By the way, whatever happened to your podcast? Still on the horizon??? I also recommend finding a best friend as good as Lisa to share it with. But that will be a much more difficult task. And what is a pod cast? For the love of god!